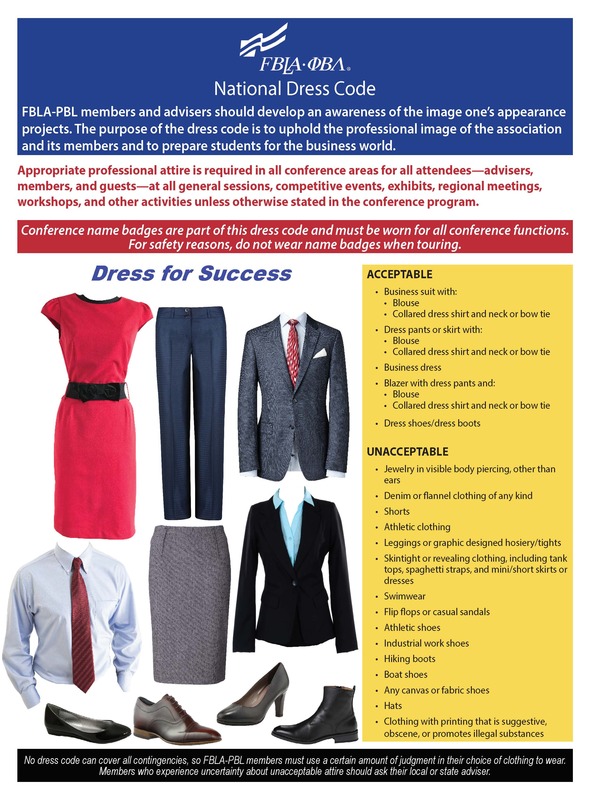 Appropriate attire is required for all attendees—advisers, members, and guests—at all general sessions, competitive events, regional meetings, workshops, and other activities unless otherwise stated in the conference program. Conference name badges are part of this dress code and must be worn for all conference functions. For safety reasons, do not wear name badges when touring. If you have any questions about the FBLA-PBL National Dress Code, please speak with your adviser. No dress code can cover all contingencies, so FBLA-PBL members must use a certain amount of judgment in their choice of clothing to wear. Members who experience uncertainty about unacceptable attire should ask their local or state adviser.